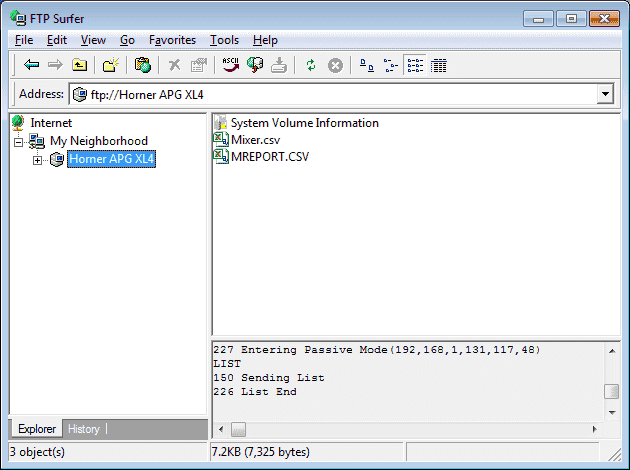 The Horner APG XL4 all in one controller through the Ethernet port can set up a FTP server. This FTP (File Transfer Protocol) server can be used to move files from the controller to the network. The server can have different security for reading and writing the files. We will use the program on the process tank to move the recipe file and report files to another location on the network. The command line prompt, automated batch file, windows explorer and a free windows FTP client software will be used. The FTP (File Transfer Protocol) is a standard network protocol used to transfer computer files between a client and server on a computer network. Command line programs were first used for FTP and still ship with most operating systems. Many FTP clients and automation utilities have since been developed for desktops, servers and mobile devices. The previous examples of a process mixer with different recipes and reports stored the information on a micro SD card. (See Recipe Instruction and Report Generator from the list above.) 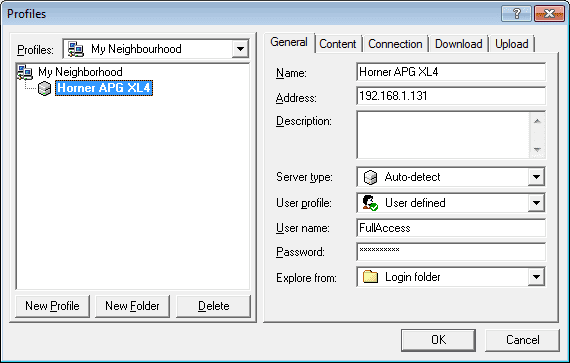 Using the FTP server we can now retrieve this information from the Horner APG XL4 without unplugging the memory card from the controller. 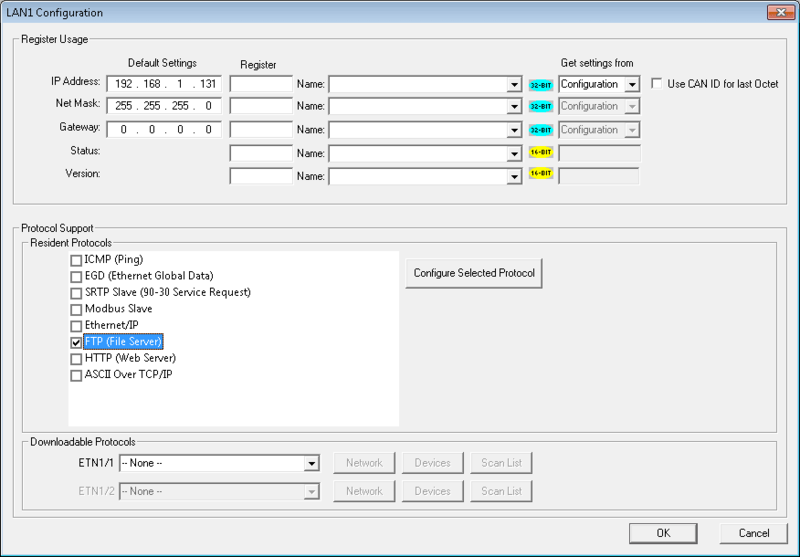 Select Controller | Hardware Configuration… from the main menu. 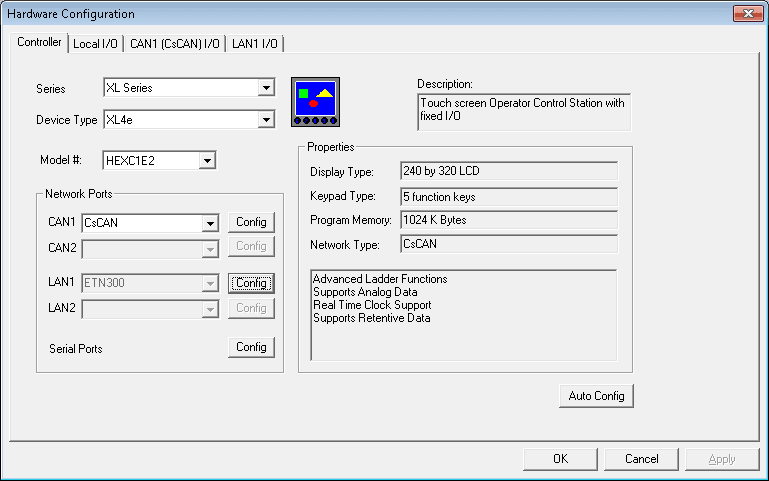 You can also select Hardware Configuration under the Project Navigator Tab. This will call up our hardware configuration window for the controller. Under this configuration window we will now select the FTP (File Server) under resident protocols. Hitting the button Configure Selected Protocols will allow us to configure the FTP Server. Select OK to confirm these entries. 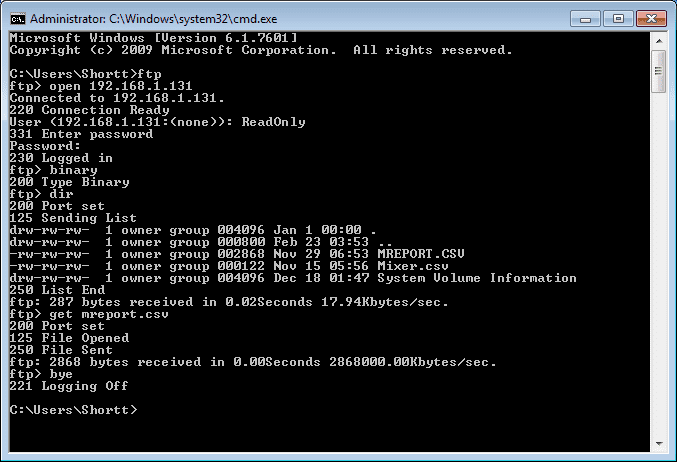 We have now set up the controller for a FTP server. We will use several different methods to retrieve the files on our FTP server. 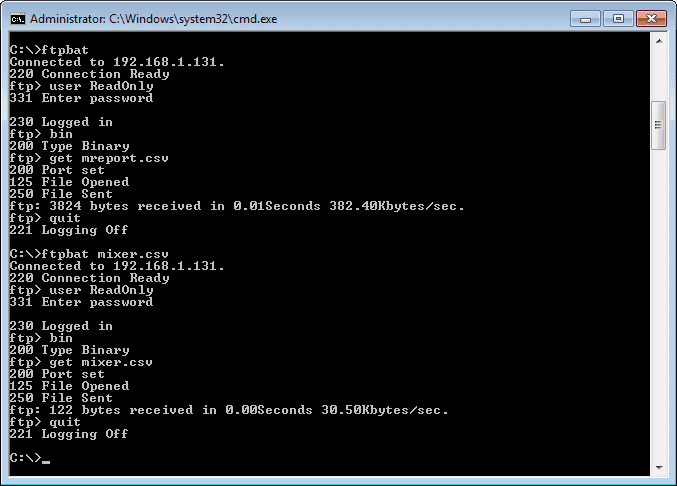 1 – Open a command prompt. Start type cmd. 4 – When prompted, type the username and password we set up above for the Read Only option. 5- Type binary and press ENTER. This will change the transfer mode. 7 – Type get filename and then press ENTER to transfer the file. 8 – Type bye to close the connection. We can automate the retrieval of files by the use of a BAT file. This file will automate the DOS commands mentioned above. The following is a batch file called ftpbat.bat. You can see that this is an older scripting language, but still usable today for redundant tasks like backing up the files. Here is the result when running the above batch script both without specifying the file and with specifying the file. Call up windows explorer by hitting the windows orb and selecting computer. On the address line, type ftp://192.168.1.131. This will call up a dialog window to enter your user name and password. Enter the settings set above and you can then use a windows explorer window to transfer files. This internet explorer style user interface includes an address bar, history and favorites menu. We create a profile from the main menu. Select File | New | Site Profile. 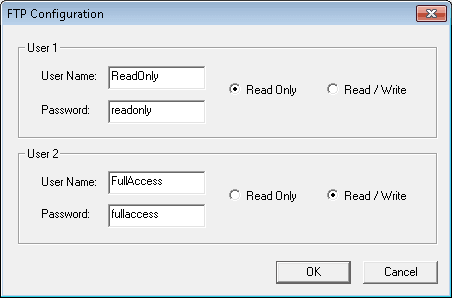 Enter the values that we set above for Full Access – Read / Write then hit OK.
Now we can look at the information on the SD memory card as easily as our own computer hard drive. See this logic in action by watching the YouTube video below. You can download this application here. It will contain all of the screens and logic programming. Next time we will look at HTTP (Hypertext Transfer Protocol) Web Server. Even if free FTP software the cost to set it up and manage is too much. Binfer is an easier way to transfer files. See Binfer as FTP replacement. How are you communicating to the Horner? 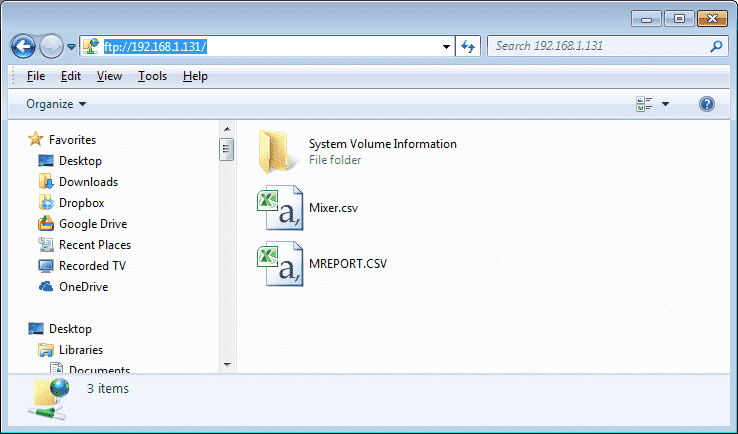 Dos, Window Explorer, Browser or Windows FTP Client program? I tried through the browser and FileZilla or Total Commander. I can log on to the FTP server but nothing more. I can’t download or send a file. I would recommend contacting Horner for this problem.